Two pieces of toast beside a jar of apple butter. 2 Can You Substitute Applesauce for Eggs When Making Pancakes? Apple butter, a condiment made from apples and sugar that have been cooked down and caramelized, is an alternative to jams, jellies and butter as a topping for toast and pastries.You may find jars of this deep brown treat in your local grocery store, specialty shop or farmer's market, but you can also make apple butter at home. While high in sugar, apple butter contains no fat and has a variety of nutrients. A 1/4 cup serving of apple butter contains 120 calories. Based on a 2,000-calorie diet, this accounts for 6 percent of the calories you may eat every day. It’s unusual to consume a serving of apple butter by itself, so count the calories in the total meal containing this food in your meal plan. The majority of the calories in a serving of apple butter come from carbohydrates. Using apple butter as a sweet topping for your toast provides you with a small amount of protein: 0.3 g per serving. You need 46 to 56 g of protein every day, however, so consider adding a side of healthy protein to your breakfast or snack such as an ounce of cheese or a slice of turkey bacon to boost the protein content. A serving of apple butter contains 30.1 g of carbohydrates, or 23.1 percent of the 130 g your meal plan should include daily. The vitamin and mineral content in a serving of apple butter will not satisfy your daily needs, but it will contribute small amounts. A serving contains approximately 1 percent of the recommended intake per day of iron, vitamin C, riboflavin, magnesium and vitamin B-6. You will also get 3 percent of the copper your body requires daily. 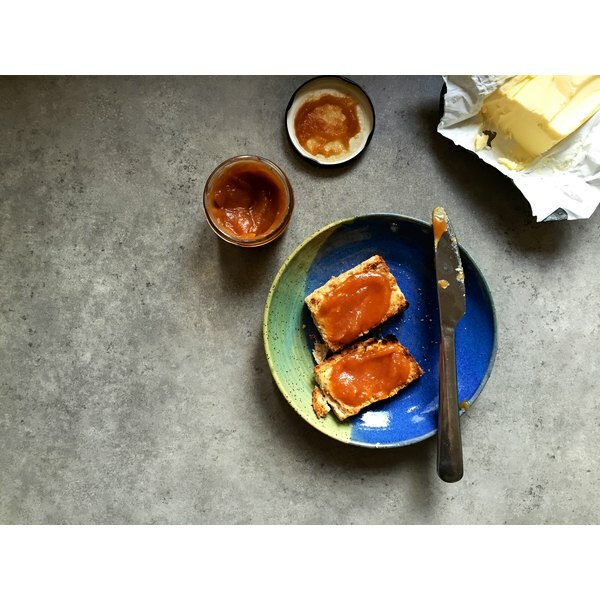 The copper in apple butter helps your body properly metabolize iron, and it plays a critical role in the function of your nervous and immune systems. Because apple butter is almost entirely made from highly concentrated apples, it contains quite a bit of natural sugar. In many cases, apple butter recipes call for some measure of granulated sugar, particularly commercially available brands which use it as a preservative. One serving has 24.8 g of sugar. While natural sugars do not generally harm you, added sugar can cause weight gain and increase your risk of tooth decay.